Dancing has an extensive array of health benefits and it is fantastic for physical, emotional, cognitive, spiritual and social well-being. Studies have found that dancing can decrease symptoms of depression and anxiety, lessen pain, minimize isolation, help heal trauma, promote healthy aging, and reduce the risk of Alzheimer’s and dementia. Dancing can also improve range of motion, balance, coordination and agility; increase muscular strength and endurance; and benefit the heart and lungs. In June 2016 five community dance groups came together for a Celebration. Each group shared the dance they had created in collaboration with artist facilitators, and everyone mingled during a dance party. Participants included dancers with diversabilities, dancers who are older adults, and dancers who are refugees and newcomers. The event was hosted by the Dance Alchemy project and the Community Arts Council of Greater Victoria, with funding from the BC Arts Council. On January 4th there was a follow-up event called Dancing in the Morning that welcomed all abilities; 45 people gathered to dance at 10:30am at Cedar Hill Recreation. Participants were enthusiastic and are interested in the inclusive event happening once a month, if we can find a large accessible space that is available on a Monday, Tuesday or Wednesday from 10:30-11:30am. Locally there is a group focused on creating opportunities for inclusive social dance, with sessions starting in March. Dancing Together brings together people with diverse ways of moving, as well as queer, trans and gender-variant communities, to try different types of social dance (such as tango) and learn to improvise together respectfully. This is a welcome development, as many dance classes and clubs around town are inaccessible to many community members, whether it is due to the venue not being physically accessible, the cost being a barrier, or the teaching style of the instructors not being inclusive or welcoming. As well as public classes, there are also a variety of ongoing dance groups that happen through organizations around Victoria in Lekwungen and W̱SÁNEĆ Homelands. I am honoured to facilitate dance groups with people with diverse ways of moving, perceiving and interacting, with six disability-focused organizations and nine organizations focused on Elders and older adults. In recent years I have led dance sessions with around 1900 unique participants, aged 4 years old to 103 years young. I live with invisible disabilities, and I notice that my sense of joy and well-being is drastically increased when I dance during the day in a community setting, compared to days when I do not dance. I asked a few participants with one of the dance groups for their reflections on the sessions. Linda, Renee, Johnny and Lawrence all said that they had not taken a dance class before attending sessions at Kardel’s Futures program. Renee said she likes that she gets to help pick the music and that there are “no bad moves.” Linda likes “everything,” and Lawrence noted that “it’s fun AND Joanne plays Cantonese songs.” Johnny said, “I feel great after dance,” and Renee and Linda said they feel energized. There have been integrated dance initiatives locally in the past, including by Geoff McMurchy, Dance Victoria, Lori Hamar, Brad Magnus and Dance Encounters. There are also examples from around the world of inclusive dance initiatives that believe that ‘if you can breathe you can dance,’ including Sins Invalid, which focuses on disability, sexuality and social justice, and DanceAbility International, which offers teacher trainings. There are many professional dance companies elsewhere that are physically integrated, where artists with and without disabilities collaborate, such as Candoco Dance, AXIS Dance, and ILL-Abilities International Breakdance Crew. 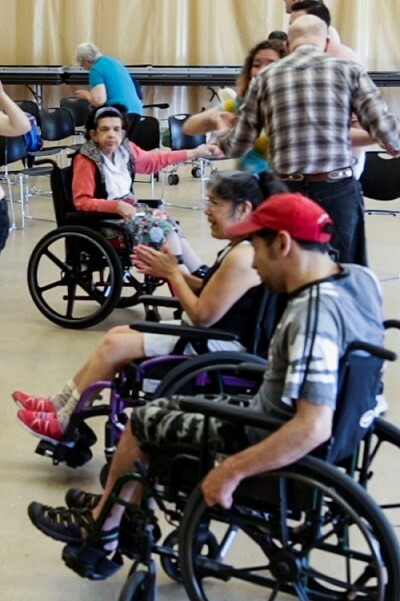 “Mixed ability dance is an approach that is accessible to all bodies and all abilities, including people with physical, developmental, sensory and neurological disabilities,” wrote the All Bodies Dance Project in an article about attending the first Canadian Inclusive Dance Teacher Intensive in February 2016. The people involved in dance companies in other cities are in dialogue, including All Bodies Dance Project in Vancouver, Propeller Dance in Ottawa, MoMo Mixed Ability Dance Theatre in Calgary, CRIPSiE in Edmonton, and Corpuscule Danse in Montréal. Although the dance sessions mentioned earlier in this article are focused on being beginner-friendly, if there is interest, we could train together in the coming years and create an inclusive dance company here, too. Adaptive Dance, Mondays 1:00-1:45pm at Cedar Hill Recreation; although the January class is full, if the waitlist fills up we will schedule another class. We are fundraising to have an All Abilities Dance Group there this April in collaboration with MOVE Adapted Fitness, facilitated by Joanne Cuffe. Learn more about the Adaptive Dance class. 50+ dance troupe, Mondays 2:00-3:30pm at Cedar Hill Recreation, all abilities welcome. The group is also open to adults younger than 50, and is free thanks to support from Saanich Parks & Recreation and Made in BC. Learn more about the 50+ dance troupe. Dancing Together, inclusive social dance lessons that bring together people with diverse ways of moving as well as queer, trans and gender-variant communities, beginning in March. Learn more about the “Dancing Together” dance lessons. Dancing in the Morning, inclusive dancing events that bring together participants from day programs and interested community members, on a Mon., Tues. or Wed. at 10:30am, happening a few times per year (or more often if a venue/ sponsors are found). Learn more about the “Dancing in the Morning” events. To be in touch about the Dance Alchemy project, or community dance programs (sessions can happen on-site at local organizations, residences and community centres), contact Joanne Cuffe. Motion Ways, a custom dance/ exercise program tailored for individuals with neurological conditions, such as Parkinson’s, epilepsy, peripheral neuropathy, multiple sclerosis, and acquired brain injury, Mondays 11:15am-12:15pm until April 10, at Gordon Head Rec Centre, a program of HeadWay, instructed by Lindsay Beal. Learn more about the motion ways program. 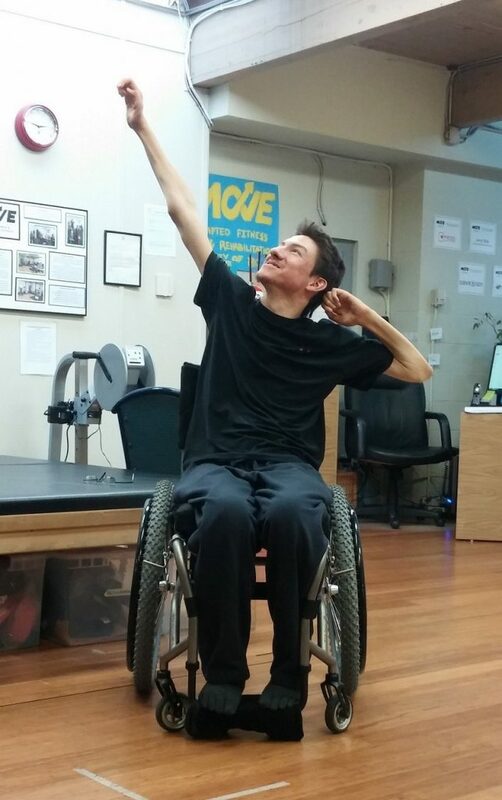 Dance Without Limits, free classes for children and youth with various disabilities, on Tuesdays 5:15-6:00pm until March 28, drop-ins welcome, at MOVE Gym, a program of the Cerebral Palsy Association of BC, instructed by Jordan Dalley. Learn more about Dance Without Limits. Chair Exercise, a dance class for people living with multiple sclerosis and anyone else interested in a seated dance/exercise class, Tuesdays 12:15-1:15pm until Feb. 28, at Silver Threads Victoria, a program of the MS Society of Canada, instructed by Katrina Pavlovski. Learn more about the chair exercise class. Adapted Dance classes for children, youth and young adults, taught by Tiffany Tjosvold. Learn more about Adapted Dance classes. Dance and Move for PD (Parkinson’s Disease) and dance therapy sessions with Sepora Mayim Jacobson. Learn more about Dance and Move dance therapy.